Suicide Squad itself might be a bit of a tonal mess, but one thing is certain—it brought a lot of weird and wonderful comics characters to life. Want to read more about about the squad now that they’ve made their mark on the DCEU? These are the comics you should pick up. While the concept of the Suicide Squad has been around since 1959, the form of the team back then was radically different to what readers and moviegoers understand as the Suicide Squad today. While there were familiar faces like Rick Flag in Robert Kanigher and Ross Andrew’s original Silver Age team, the series was more about a group of adventurers taking on wild missions than the villainous secret taskforce we know them as now. That imagery comes from the legendary work of John Ostrander—and later his wife and co-writer, Kim Yale, before her death in 1997— Luke McDonnell, and Bob Lewis’ reboot of the team in the Post-Crisis on Infinite Earths continuity at DC. Originally beginning as a one-off miniseries, the concept was so well received that DC turned Suicide Squad into an ongoing series, seeing it introduce us to Amanda Waller, the bold agent behind the creation of Task Force X. This volume collects the first eight issues of Suicide Squad, so you can discover where the film’s major influence first began. While that first volume is important, if you want to see the original Suicide Squad really get into action, it’s actually the second volume you’ll want to read. Collecting the next eight issues of Ostrander, McDonnell, and Lewis’ series, this is the point at which Suicide Squad really dives itself into the world of DC superheroes, rather than the traditional and politics-themed espionage it began with. Most importantly, it’s this volume that includes issue #10 of the series—the famous “Up Against the Wall.” This is the story that tackled head on how Suicide Squad as a group of government-sanctioned officials could work in a world where the very people that locked them up are against them—in this case, Batman. It’s the first fateful encounter between Amanda Waller and the Dark Knight—a moment that inspired encounters between them in other mediums, like their infamous meeting in the Justice League cartoon—and one that solidifies Waller as one of the most imposing and no-nonsense badasses in DC Comics’ roster. One thing missing however from those Ostrander, McDonnell, and Lewis comics that might make it a little alien to people introduced to the team through the movie, is Harley Quinn. She didn’t exist yet when the Suicide Squad comic began, and despite the fact she’s a character highlight in the film—and a fundamental part of the Squad—it wasn’t until DC’s New 52 reboot in 2011 that she became part of the team, and she’s been inseparable ever since. Adam Glass, Federico Dallocchio, and Clayton Henry’s run on the Suicide Squad is solid, if not as well-regarded as the classic comics—but if you want to see how Harley fits into the Squad in a modern setting, they’re important reading. If you want even more recent material, you could try jumping into the brand new Suicide Squad series that began as part of DC Rebirth last week—the premise is essentially the same, just brought back to square one again. If you want something that’s closer to the makeup of the movie, it’s your best bet. In the Suicide Squad movie, Deadshot and Katana are almost polar opposites to each other. Deadshot is practically the star of the film, and Katana... stands there and occasionally shouts some Japanese while stabbing something. But this recent miniseries—part of a set of comics that were essentially designed to hype up the movie by telling stories specifically with the characters due to appear as part of the movie Squad—shines the spotlight on both in some interesting ways, if you’re interested in learning more about the two characters on opposite ends of the movie’s attention spectrum. The individual issues of the series were split in half, one side focusing on Deadshot (from Brian Buccellato and Viktor Bogdanovic) and the other focusing on Katana (from Mike Barr and Diogenes Neves), but they’re being split into separate collections that keep each story separate. Of all the “Most Wanted” stories, they’re definitely the strongest. 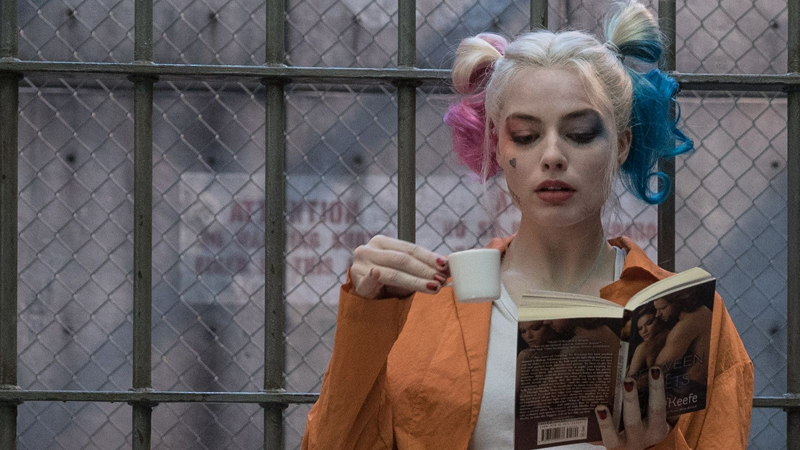 Okay, so this is most definitely not a Suicide Squad book—it’s Harley’s ongoing comic. But considering that Harley is one of the absolute highlights of the film, it’d make sense to point you to her own excellent series, one that has cemented her as one of the most popular characters DC has at the moment. Unlike the movie, which still depicts the Joker and Harley’s relationship as a romantic (if messed up) one, Jimmy Palmiotti, Amanda Conner, and Chad Hardin’s series has pivoted Harley into a character moving on from her dependence on the Joker to make her own life. It’s fun, full of charm, and has helped turn Harley into a character of her own rather than a Joker sidekick, and even if it’s not necessarily Suicide Squad—if you liked her in the movie, it’s a must. Likewise, this isn’t a Suicide Squad book itself but one important to understanding one of the film’s breakout characters. After revitalizing the character for his Suicide Squad reboot, John Ostrander—teaming up with is wife Kim Yale and Squad artist Luke McDonnell—launched a miniseries for Deadshot that still remains as one of the definitive tales about the character. Like the film, Beginnings explores Deadshot’s relationship with Batman and also his checkered, tragic past. It’s a thorough examination of what made the character the way he is—and given his importance to the cinematic incarnation of the Squad, it’s one to see where this take on the character all began.